The best Southern dishes are rich and flavorful, a little bit spicy and loaded with fresh vegetables. 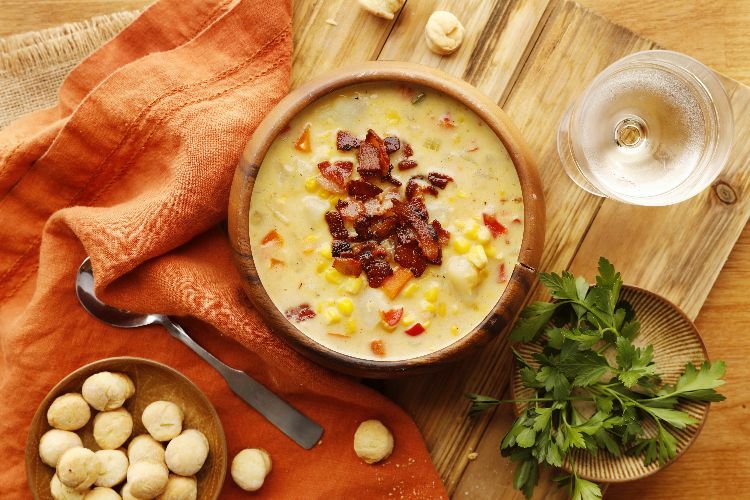 This Southern corn chowder recipe is a shining example. It’s amazing made with fresh, height-of-summer corn, but it’s absolutely delicious made with out-of-season or frozen corn, too. I like to cook bacon right in the stockpot before I make the soup. I garnish the finished soup with the bacon, but I also use the rendered bacon fat to sauté the vegetables. This gives the chowder layers of salty, smoky bacon flavor, which complements the sweet vegetables beautifully. Heat a stockpot over medium heat. Add the bacon and cook, stirring occasionally, for about 5 minutes, until the bacon is browned and crisp. Using a slotted spoon, transfer the bacon to a paper towel-lined plate. Reserve the cooked bacon for serving. Add the onions, carrots and celery to the bacon grease in the stockpot and cook, stirring frequently, for about 5 minutes, until the vegetables are soft. 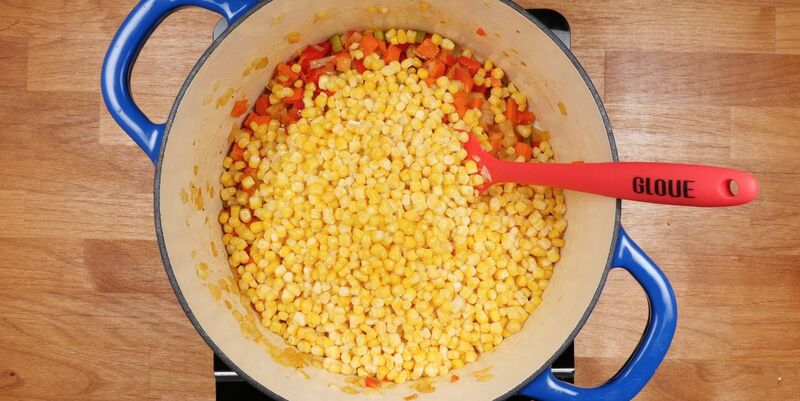 Add the garlic, bell peppers and corn and cook, stirring frequently, for 10 more minutes. Sprinkle the flour over the vegetables in the pot and cook, stirring, for about 3 minutes. Add broth to the vegetables, stirring to incorporate the flour. Add the potatoes, bring to a boil and simmer over low heat for 40 minutes. Stir in the cream and season to taste with salt, pepper and cayenne pepper. Serve hot with the bacon sprinkled over the top.